Okay, so I have done the whole “Grocery List” thing a few different ways over the years. At first there was the “Just Wing-It” approach. This means going to the store and grab things that you remember that you need. This of course leads you to having to go back to the store to get a few items that you missed. After a few times of that, you write the list down . . . as in on a piece of paper. After putting an item in the cart, you cross that item off of your list. This then morphs into the “text file on my phone” style. After you put an item in your cart you then delete that line from the text file. Both of these styles leave two key things out . . . How much is all this going to cost me? . . . And which store is cheaper? There are two major grocery stores in My Western Home. I won’t mention them but if you are astute you can figure them out. They are comparable and competitive on prices for most items. Sometimes, however, the price varies greatly on a particular item. Then there are also the times when I know that I have a very limited amount of money to spend on this grocery run. What then? I then end up having my calculator app open on my phone and adding items up as I go through the store. I do this to avoid the shock at the till or worse, having to put items back. I know that I am not the only person to have to do this. How to avoid that embarrassment and capitalize on the price variance (on the stuff I buy on a regular basis) between stores? I will now try this little gem out this weekend in order to eliminate all that. This is a spreadsheet that I have created on my iPad. It is just a simple list of the items that I buy on a regular basis. There are two identical sheets, one for each store that I go to. As I go through the store I can update the price of each item at that store. When I am done I will know how much each item is and what the total should be. This way I can put items back if I have to BEFORE getting to the till. 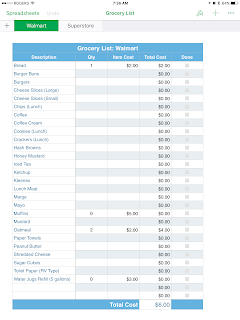 Even better, is that when I am at home, making my list, I can have an estimate of what I expect to spend at the store. As well, I can see, which store is cheaper on which items and make a list for each store on which items are cheaper/best to get at each store. This may entail me to go around each store first pretending to shop and just updating prices on my iPad. I have the time and both stores are my “corner store” so to speak. I have no idea what kind of reaction the store people will have with me shopping with my iPad with me. My phone is very old, so it won’t work for this. 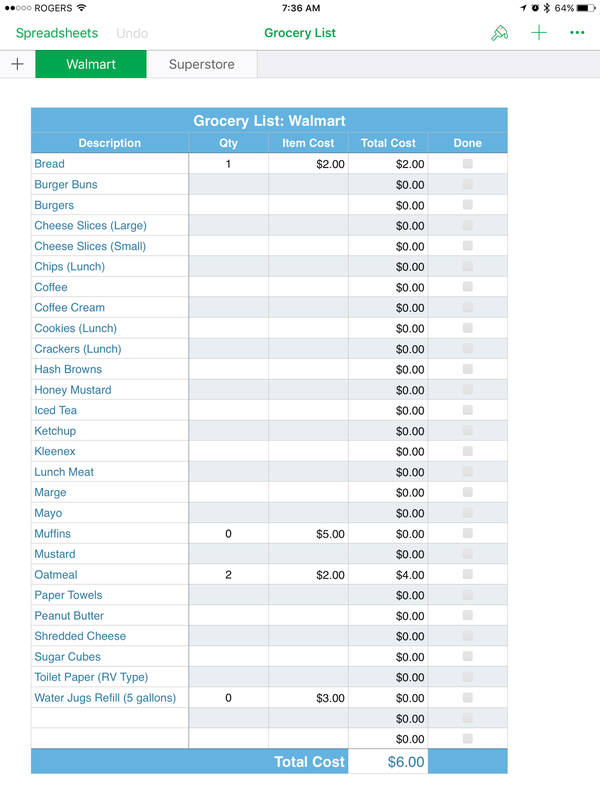 If you want a copy of this Grocery List Spreadsheet for yourself just message me and let me know: What format? (Numbers or Excel) and what email address to send it to.